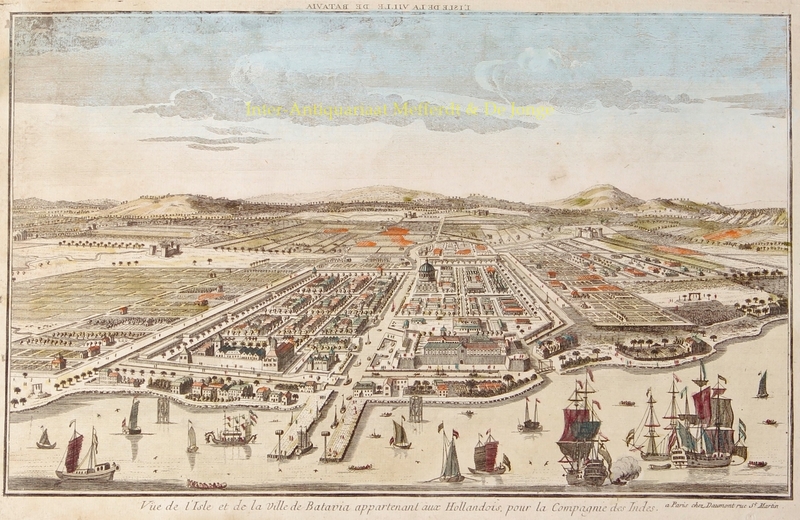 “Vue de l’Isle et de la Ville de Batavia appartenant aux Hollandais, pour la Compagnie des Indes” [View of the isle and the town of Batavia belonging to the Dutch, for the V.O.C.] Copper engraving made by Jan van Rijne in 1754. Optical view published by Daumont in Paris. With original hand colouring. Size (print): 24 x 39 cm. Located at the mouth of the Ciliwung River, present-day Jakarta was the site of a settlement and port possibly going back as far as the fifth century A.D. In 1619, the Dutch captured and razed the existing city of Jayakarta (meaning “glorious fortress” in Sundanese) and built the walled township of Batavia, which became the colonial capital of the Dutch East Indies. Van Rijne was born in the Netherlands, but spent most of his working life in London, where he specialised in producing engravings of scenes from the British and Dutch colonies. This town view shows us the situation of around 1655.